Home>Blog>Manual Testing>Is Manual QA required for Website and Apps? Is Manual QA required for Website and Apps? This article is targeted to advanced users having a question in mind that automation is going to overcome jobs of manual tester. This article will explain the importance of manual testing which could not achieved with automation. One can understand the roles and meaning of being a tester. This is very common and frequently asked question related to software industry. We all are aware that industry is transforming with nitro pace. The term test automation is not new to anyone. These days each organization is focusing to automate some part or whole, to overcome the long testing time associated with manual regression cycles. QA always has conscious about this news, that in a world where people try to automate everything, do they fit for QA Role? Is Manual QA yet required in industry? Before going to in depth discussion, let us first discuss the benefits of test automation. Everyone is going for automation as it simply reduces the time for each test cycles. It is very easy that, you can write a test script once and it can be run multiple times in less than a minute, even you can run test script in parallel with other tests. Test teams having an automated test suite can find that it look less time than run of manual regression test suite. Team can easily recognize that previously it took days to complete a regression test suite but now this can be done in minutes. Team can get client feedback faster as per result of regression test suite, bugs are identified sooner and code can be pushed to production faster. We all know that human can make mistake, it’s part of our nature. Manual QA can miss any test step or documentation for particular scenario while executing the same test cases multiple times but automated tests are a form of living documentation. Automated test can run multiple times with same perfection and without any deviation. Mentioned benefits are great and add quality to software, but these are not most powerful benefits of testing even if is test automation. Many speakers, who attend and conduct conference on Agile based testing made a very useful distinction what automated tests do: they check functionality, but checking alone does not add up to testing. The real meaning of testing is defined in below image. Automated test scripts are dumb. We can only write automated scripts to check scenarios that we already know about. Scripts can be run and check whether the system still does what we expect it to do in those scenarios. A generous question arrive in each of us mind that from Where do those scenarios come from? Answer is very simple and straightforward from an understanding of what could go wrong in a system. Now another FAQ who understands the system? Again answer is very simple, Manual QA who are having extra edge , they are the one who has better module understanding and must be a part of a project even we have an existing test automated suite. 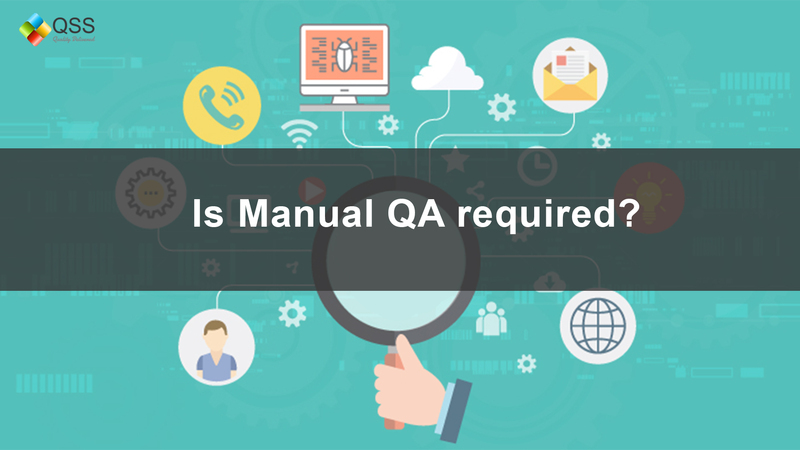 Manual QA can perform these tasks which test automation cannot do. Manual QA can perform exploratory testing. This cannot be achieved through test automation. Only Skill testers can perform exploratory testing. One can easily find bugs, enhance module understanding and invent scenario and construct test cases. Manual QA can address client CR in a go while on other hand we require time to build test automated scripts for each CRs. Manual QA can provide a proper balance with each frequent CR. The more scenario you cover in automated test scripts, you require a proper balance in maintaining a source code, unless it become a rat’s nest with each client enhancement or CRs. Automates test scripts has more accuracy than manual QA but scripts cannot entertain your clients enhancement and CRs. Automated scripts are having only that much of knowledge which is known, but manual QA are responsible for hidden elements that can cause data breach or any functional concern for system. In conclusion, we can say that both are from different league but having an importance in project. Manual QA Testing need to enhance module knowledge and gain some skills through certification with growing experience and they are the backbone of any project from client’s perspective. Aaqib Ansari is a Sr.QA Engineer currently working with QSS Technosoft. He is a technology writer in .Net, Selenium, SQL and frameworks like TestNG. He has completed his Master’s degree in Computer Science.